“Public Policy Challenges – European and Regional Dimensions” is the overarching theme under which the Economic Policy Institute continues to support for 19 years in a row the expert exchange and leadership growth in Bulgaria’s vicinity. 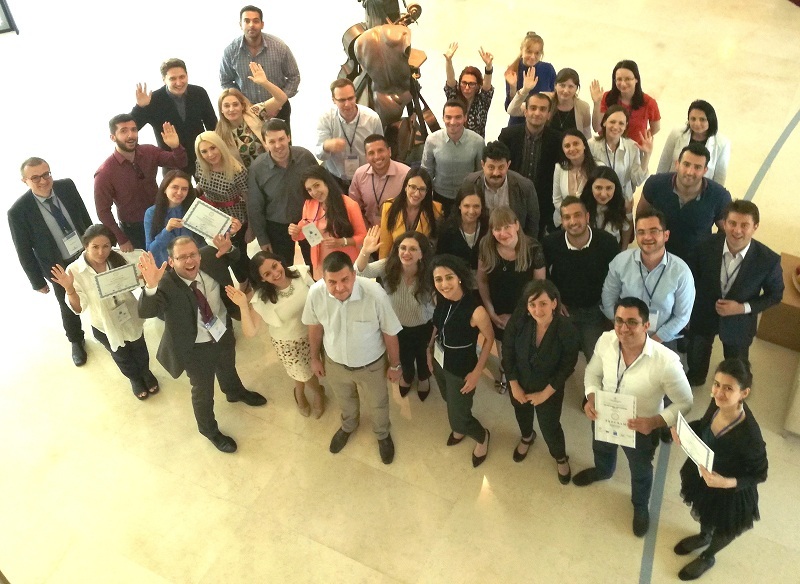 The 2018 Summer Seminar for Young Public Policy Professionals from Southeastern Europe and the Black Sea region that took place in the period May 28 – June 1, 2018 in Albena Resort further contributed to the sustainability of these efforts. The 19th edition of EPI’s flagship regional initiative was part of the official calendar of the first Bulgarian Presidency of the Council of the EU and was made possible thanks to the kind financial support of the Hanns Seidel Foundation, the European Commission Representation in Bulgaria, the Central European Initiative and the Austrian Embassy in Sofia. The rigorous selection process with a record number of applications resulted in a talented pool of participants from public administration structures and policy-oriented research centres from 14 countries – Albania, Azerbaijan, Bosnia and Herzegovina, Bulgaria, Croatia, Georgia, Macedonia, Moldova, Montenegro, Romania, Russia, Serbia, Turkey and Ukraine. The diverse group of young professionals benefitted from the knowledge and expertise of 16 prominent speakers. The seminar was opened with welcome remarks from EPI’s Executive Director, Mr. Yasen Georgiev, and the Institute’s Honorary President, Prof. András Inotai. The Official opening also featured congratulatory addresses by long-term partners such as Dr. Klaus Fiesinger (Regional Director for South-East Europe, Hanns Seidel Foundation) and Mr. Boyko Blagoev (Head of Communications at European Commission Representation in Bulgaria). The evening’s highlight was a video address by Mrs. Lilyana Pavlova (Minister for the Bulgarian Presidency of the Council of the European Union 2018) who reminisced about her own experience with the Seminar and left the audience with food for thought on the pivotal role of digital transformation in the public sector. Throughout the week participants and speakers had the chance to discuss on a variety of topics and exploit from different analytical angles key issues on the agenda of the EU and the SEE & Black Sea region countries. - Mr. Marin Lessenski, Program Director, Open Society Institute, Sofia. 1. Why the Black Sea area should be considered a region and how to justify its’ existence? 2. How to convince the current EU member states that an enlargement towards the Western Balkans would benefit them all? - Mr. Victor Bojkov, Advisor, DG NEAR, European Commission, Brussels. - Mr. Gorazd Režonja, Policy Analyst, South East Europe, Global Relations Secretariat, Organisation for Economic Co-operation and Development (OECD), Paris. - Mr. Pavel Ivanov, Executive Director, Institute for Public Administration, Sofia. Further enhancing the good governance discussion, Ms. Mariana Trifonova (Senior Project Expert, Economic Policy Institute, Sofia) exclusively presented the preliminary results from the second edition of EPI’s annual survey among the Summer Seminar alumni network and current participants. The mapping of public policy challenges in SEE and the Black Sea region aims at capturing the sentiment among the group of Summer Seminar experts on the current state of governance in their countries and is considered by EPI a bottom-up approach for examining current public policy challenges in SEE based on insiders’ point of view as well as a unique excerpt of opinions from neighbouring EU Member States and non-EU Member States. The afternoon on the third day of the forum provided an opportunity for the participating young leaders to reflect a bit more on two of the key issues in the program so far. EPI’s team designed two parallel workshops facilitated by Yasen Gerogiev and Mariana Trifonova, respectively. Utilizing a formalized policy debate framework, within each workshop opposing groups ‘crossed swords’ deliberating on opportunities and threads deriving from “Digital transformation” and “Chinese investments in SEE & Black Sea countries”. The final seminar day addressed the topic of public diplomacy and strategic communications with a contribution from Assoc. Prof. Plamen Ralchev, International Relations Department, University of National and World Economy, Sofia. His intervention was followed by a video address by Ms. Monika Panayotova, PhD (Deputy Minister for the Bulgarian Presidency of the Council of the European Union 2018). The formal seminar agenda was concluded with a lively wrap-up discussion and a certificate award ceremony where Mr. Yasen Georgiev and Mr. Bogdan Mirtschev (Hanns Seidel Foundation Representative for Bulgaria) congratulated all participants on the successful completion of the 2018 Summer Seminar. Before the departure of all young experts to their home countries, they had the chance to further strengthen their bond and network informally. In an effort to facilitate this process, EPI prepared a diverse cultural program: an excursion to the picturesque Kaliakra Cape and a guided tour through the beautiful maze of the Botanical Garden and the Palace of Balchik. The evening concluded with a farewell dinner in a local restaurant featuring unique folklore performances: Bulgarian horos (chain dances), Kukeri and mysterious Nestinari fire dancers listed as UNESCO Intangible Cultural Heritage. A follow-up publication with XIX Summer Seminar proceedings will be compiled and published in the second half of 2018. The feedback gathered formally and informally from partner organizations, speakers and participants during and after the XIX Summer Seminar proves that the forum has lived up to the expectations for providing a platform that delivers in terms of an increased exchange of knowledge and enhanced regional cooperation among young experts from the broader SEE and Black Sea region. Last but not least, we at the EPI would like to express once again our gratitude to the participants, lecturers and supporters of the 19th Summer Seminar for Young Public Policy Professionals from South Eastern Europe and the Black Sea region. EPI is already looking forward to the 20th jubilee edition.